I was at a TedX event some days ago and one of my favourite speeches was “Ascending Babel: The gravity of language on our thoughts” by Prof. Panos Athanasopoulos. Languages can affect our brains and behavior. Thinking and/or speaking in a foreign language can alter our train of thought, drive us to be more socially sensitive and overall create a different personality. Such a unique and inspiring theme, completed as it starts with creation, moving through the changes of the language and ending with its death. 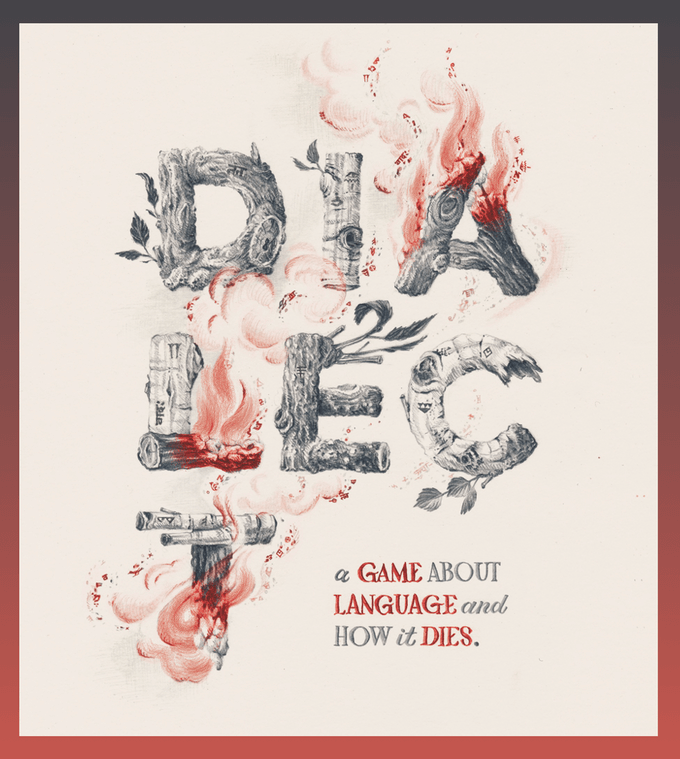 The second thing that caught my attention is that Dialect is a GM-less game which is rare for an RPG. Players choose a backdrop from which the Isolation emerges, for example “The Martian Outpost”. Then three aspects are defined for your community, creating the initial seeds from which your language grows. (g. We need water) Finally each player chooses a character which has a unique relationship to the aspects. Each turn is divided into three stages. First, you have to choose a concept card and tie it to one of the aspects. Then, build a new word that will define this concept and will be built around the relationship between concept and aspect. Finally, you will have a short conversation where you will explore what this language means to two of the characters at the table. In the end, you will move through an age and pivotal events will take place as time goes by, making you take hard choices that will have a strong impact on the Isolation. The game takes place over three ages and then the Isolation ends and the language dies. Having a strong team of experts, Dialect comes with a lot of work on the backstage, beautiful aesthetics and an overall package that offers “Food for thought” for me. If it drew your attention, you can check out the Kickstarter campaign, which is already funded with more than 1,700 backers and 80.000+ dollars pledged. HEXplore It: The Valley of the Dead King – Will You Defeat Him? Are You Ready for an Alchemical Crystal Quest?